I hope to see you at the launch or somewhere else during 2017. And to all of y'all... Happy New Year! Here's to a year of good health and happiness. The Homework Strike is a Junior Library Guild selection! Not to be tooting the Homework Strike horn or anything, but... hey, y'all... it's a Junior Library Guild selection! Okay - fine: Toot! Toot! It's life imitating art imitating life or some variation on that theme: all November long, parents in Spain were asked to put their kids on a homework strike. The strike was for weekends only, and if a school sent home homework, parents were asked to send it back with a note saying "nope" and excusing their kids from doing the work. 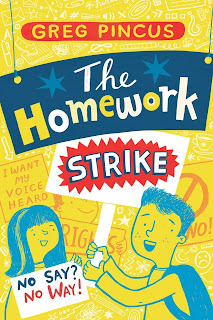 The strike was organized by CEAPA - Spain's national organization of parent associations - because, they said, homework is detrimental to children. Based on a 2014 report by the OECD, Spain ranks 11th on a list of amount of time the average 15 year old spends on homework per week. The US is 15th. There were news stories throughout Europe, unsurprisingly, but I was fond of the article and comment thread on The Guardian. I have yet to read an article on the impact of the strike and would really love to find one from the student perspective. If you've run into one, please let me know!